The photo above says it all. 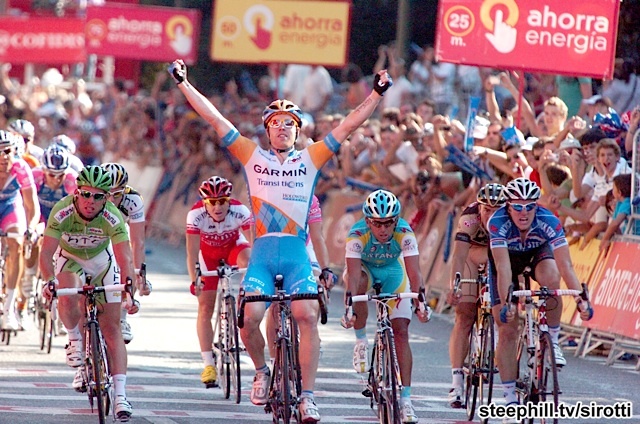 There’s local boy Tyler Farrar winning the final stage of the Vuelta a España today over Mark Cavendish (in green, to the left of the photo). I’ve written many times in my Tour de France posts about Cavendish, the awesome Manx rider who has dominated the sprint stages of the Tour de France over the last three years. Farrar may be his closest challenger. Farrar won two stages of this year’s Giro d’Italia, but was injured early in the Tour de France. He regained his strength near the end, but couldn’t beat Cavendish. In the Vuelta, Cavendish and his team won the opening time trial, and Cavendish won three late stages, thereby securing the overall points jersey, but as you see, Farrar won today’s ride into Madrid, having already won one of the early stages. Farrar is 26 years old, Cavendish 25. Their rivalry will be worth watching over the next few years. I wish them both good health so they can compete at their best. Note: It’s not really my goal to be too obscure. As a bit of a primer, let me explain that there are three “grand tour” races in cycling each year, the Giro d’Italia, the Tour de France, and the Vuelta a España. Each lasts three weeks, with daily stages taking a variety of forms — long races with several mountains climbed along the way, long but relatively flat races with the top sprinters able to stay near the lead and then fight it out for the stage victory, individual time trials, team time trials. Sprinting specialists such as Cavendish and Farrar try only to survive the mountain stages so they don’t have to drop out of the tour and are thus able to compete for victory in the flat sprint stages. By surviving, they are also able to compete for the title of best sprinter of the tour, which is based on acquiring the most points for high finishes (and high standing on intermediate positions of flat stages) each day. Also, my calling Cavendish a Manx rider refers to the fact that he is from the Isle of Man.